Sinn Féin 'not trying to exploit Brexit' to push for united Ireland. Image caption Gerry Adams said his party was focused on making sure that people have "a decent standard of living"
Sinn Féin leader Gerry Adams has said his party is not trying to "exploit" Brexit in its campaign for Irish unity as the issue is "too important". He claimed Brexit posed a "huge threat to the economies north and south and to peoples' rights" and said his party was focused on dealing with those problems. He added Sinn Féin still wants a border poll and are "confident" of persuading people to vote for a united Ireland. He gave a cautious welcome to Friday's UK-EU Brexit deal on the Irish border. A quick fix for a slippery slope? Mr Adams signalled his support for some of the reassurances in the text agreed by Theresa May's government and the EU negotiating team. He said his party had campaigned for special status for Northern Ireland within the EU after Brexit and added that they "don't care what it's called" in the text. 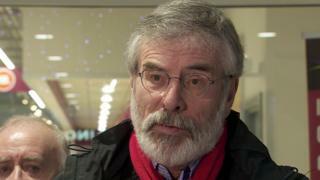 However, the Sinn Féin leader said it was only the beginning of a process and the detail could take years to finalise. "Our position is for special designated status - clearly the north has a special status," he said. "Clearly the Good Friday Agreement has been put front and centre in terms of all of this; clearly the issue of the border has been put front and centre. "There is ambiguity around some of the detail." Mr Adams added: "In so far as it goes, we have a cautious welcome for what has been achieved but it's only the beginning of a process of intense negotiations which will last for the next number of years." He explained that his party was particularly concerned by the "insistence" that Northern Ireland will leave the Single Market and Customs Union along with the rest of the UK. The Sinn Féin leader was asked to respond to criticism that his party was more interested in weakening Northern Ireland's position within the UK than in addressing the questions raised by Brexit. "We're always about weakening the position within the union - that shouldn't come as any surprise to anyone - but we're not trying to exploit this issue," Mr Adams replied. "It's too big an issue. I've made it clear that Brexit is a huge threat to the economies north and south and to peoples' rights north and south." He said his party's immediate focus on was making sure that people have "a decent standard of living". "The issue of Irish unity? That has to be the big challenge for us - to persuade people who don't want Irish unity that that's the best option and we're very confident about being able to do that," the Sinn Féin leader added. Brexit deal: A quick fix for a slippery slope? Brexit talks: Where next for negotiations?